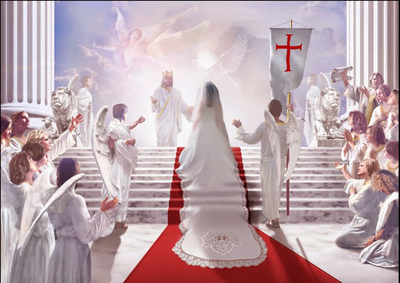 Tonight, we really felt inspired to share from Chronicles of the Bride, our first book, the episode of the Bride being married to Jesus, The Celestial Wedding. And I just wanted to give you a footnote on that beforehand, so that you would understand. There's a passage in here where it talks about being one spirit, one heart and one body with our Lord. And, what that refers to is the Body and Blood of Jesus in communion. That's the way that we commune with Jesus and become one with Him, as through receiving communion. So, when that part of the narrative comes up, I want you to understand what it's about. It's not about anything carnal at all, because there's nothing carnal in Heaven, not in the least. And, I know the Scriptures say we're not married or given in marriage, but we're like the angels. But, we are His Bride, and He's different! It's not that we're marrying each other, but we are being wed to Him, united to Him forever as one. And that's how our spiritual children come forth, as being united with Him forever as one. So, I'm going to go ahead and share from Chronicles of the Bride our first book, page 94. And, by the way, that is a free download on Heartdwellers.org, and Amazon has the hard copy. The Lord bless you all, and I hope that you can enter in this very, very sweet narrative. Put yourself in the place of the Bride, because someday that's what you're going to be doing. And, I believe that the Lord wanted this done tonight because, we've had some difficult messages lately, and things ARE ramping up in the world, and I think He wants us to focus more on the beautiful event that's going to happen when He comes for us. All is set, as the guests begin to arrive. You gaze across the lawn, distracted from those who are speaking with you. I, with my maids, can hardly contain myself, so much in love am I on this day. I sneak a glance over and across, looking back at you, staring; we cannot help ourselves. Everything is beautiful. The courtyard in front of the palace is all arranged, and flowers with white silk ribbons have been hung with great care and elegance. I spy a young fawn, as she meanders through the crowd, taking her leisure, and an occasional bit of food from the server's table. You look back at me and laugh with delight. The estate is magnificent, with its lovely gardens and hedges. The trees themselves softly sway in the gentle breeze. Two white doves glide across the yard, to the lustrous altar at the steps of the mansion. They are carrying a shining banner, to be hung over the main entryway. It is all so very much like a storybook tale, so colorful and fair. So many things to take in with my eyes, yet I am constantly drawn back to You. I apologize blushingly to my friends, who are assisting me with the last minute details of my dress. I have never been so happy in my whole life. I am faint at the thought of my destiny and great fortune; to have the King of Kings and the Lord of Lords as my Beloved, and I, chosen to be Yours, to be united as one, together throughout all eternity, in your Kingdom forever. As the moments draw shorter, I see a beautiful young flower girl running up to me. She is carrying in her hand a piece of fine linen parchment with gold borders. I smile at her, and receive the note from her little hands. As I begin to read the words, I can scarcely contain myself. The fragrance of my Beloved permeates the message that I hold, "My Dearest, My Darling, My Love, look around you - this whole Kingdom is yours." How can I keep from lapsing away? O' how can I breath? So completely swept away am I, so enraptured are my senses. My Beloved is truly my God. My God has truly condescended to me, his lowly creature, and raised her up above the heavens, seated with Him upon His Celestial Throne. I rejoice in My Lord and My God, my heart and the very soul within me. Let us dance among the lilies, my Betrothed. Let us approach love's banquet and present our vows upon the Altar of God. The guests are all seated, and a cluster of heavenly strings begins to play with such divine sweetness, I can hardly begin to walk, as we advance toward our nuptials. Without hesitation, my Groom approaches, regal as the majestic stag, leaping across the mountains. You turn towards me, piercing my heart with Your countenance. Who will keep me tethered to the ground, so carried aloft is my spirit within me? I am faint with love. The very wind subsides at Your magnificent beauty. Ah My Beloved, My Love most superb. "My friends and family, guests from near and far, I welcome you this day to share in your Masters Joy! I have truly waited, waited time beyond time, for this Most Holy day of Fulfillment. The day when Love receives the fruit of her labors. It is a day that I have long dreamed of, from the foundation of the world. The day when all things are brought to completion, when all Creation shouts to receive it's Queen. For this day, I give of Myself, most fully and completely to you, My Bride. This day I join with you, forever united as One; one heart, one mind, one spirit in God. I rejoice with great gladness for you, O' spouse of My Soul. We shall be now, and forever more one flesh, to the Glory of God, fruitful and happy in His Paradise without end." "My Beloved, Heart of my Heart, and Eternal life of my life; I give to You forever more, from this day forward, my whole heart and soul to be Your wife. To be wed to You on this day beyond all days, in this dream beyond all dreams, still not a dream at all... no, something much, much more. How could a thousand heavens yet give You due honor and glory and praise? For You spoke the heavens, and they were created. You breathed from Your mouth, and all of Creation came to exist. Before You, nothing was, and beyond You, nothing shall ever be. My Beloved, My Husband, to whom I give myself completely without reserve, be Thou mine forever, and I yours. Fiat! and Amen! Let it be unto us as you have said, and let our children be like olive trees around our table. Let the Heavens rejoice and Earth be glad! Hosanna to my King!" There are no words to describe the utter bliss of our embrace, as you kiss me softly, and draw me into the folds of your garment. Our vows have been made before God and all His people. As we walk the lane back through the cheering guests, I recognize so many saints, and friends and family. My amazement knows no bounds, as You whisk me away into our waiting carriage. My Groom, my King, my Love of all Loves.